This is the Royole Flexpai portable device. Some of you wanted this, and now you’ve got it. 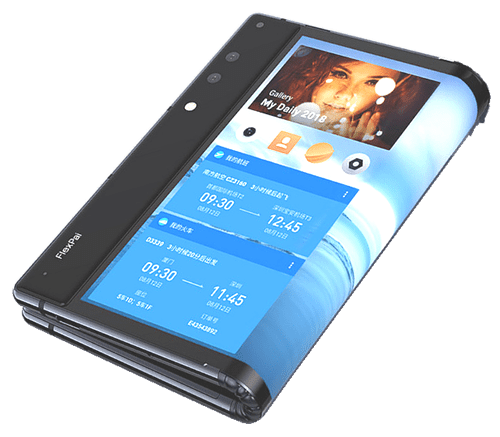 This is the very first announced and distributed foldable phone. They call it a phone, but it’s more like a foldable tablet given its size. The funny thing about this device is when you fold it in half, it turns into 2 phones. As you’re bending it in half just when it feels like it’s going to crack and break, it snaps into place with a click. So maybe now you can sell your laptop and phone and use just that. Let’s see. When it’s open an in a “tablet” form is when you can actually use the full 4.78-inches of the display. It’s a 4:3 aspect ratio, 308 pixels per inch, 1920 x 1440 resolution, up on the top there are speakers, the power button and volume rockers surrounding a fingerprint sensor, and finally a USB-C charging port. Say goodbye to the headphone jack on this device because it’s not there. In the middle there’s no not noticing the rubber hinge system. The hinge system’s reliability it a little bit surprising. Every time you go to close it it will feel like it’s going to break but then pops into position and the device becomes really firm and sturdy. It does leave you with one of those Microsoft Surface gaps, open it back up and now it’s a tablet again. Now, is it a good tablet or usable? No. Is it a good phone or usable? No. Here’s the catch, Royole was a company that was literally founded for the same of making flexible displays. The founders of the company are Stanford graduates and they founded it in 2013. They quickly came up with a 1.1-millimeter thick display film that they’ve implemented onto purses and handbags, t-shirts, hats, and a few other crazy things. As far as technology goes, it’s super cool, but in terms of implementation and the way it’s being done, this phone/tablet device is miles away from being a finished product. The camera is terrible. The interface is terrible. When trying to pivot from portrait orientation to landscape mode, sometimes it works and most of the time it doesn’t. When trying to switch it into phone mode, the way you naturally handle it, your fingers are all over the screen so you’re triggering things you don’t want to trigger. This thing is so awkward that I feel like my grandfather would probably feel with any modern tech in his hand. Looking at it, the technology itself isn’t particularly great. It has a lot of vibrancy to colors, as OLED usually does. Really it has all of the hallmarks of really, really AMOLED displays. It has banding in white sections, the lighting seems to be inconsistent with dark patches in the middle of the display, it’s not bright, and it simply isn’t great. Again, making the display flexible is no small feat. In terms of engineering, that’s an achievement. But I feel that this needs plenty more time and work before it becomes a real retail product. Which is funny because it’s actually already selling in China and you can actually buy a Developer Edition for $1,320 in the United States. They do deserve some praise for its build quality, which even though it’s quite chunky, it’s really quite good. if you’re the kind of person that likes a bit of chaos in your life, a little bit of unpredictability, and you’re just tired of the same old tech, doing the same old things that you actually want them to do, then this is for you.